Too much stuff to enjoy! TDS TV on Demand is offering up some outstanding films, including the smash hits “Straight Outta Compton” and “Goosebumps.” And on network television, there’s a number of exciting new series and specials, including an “X-Files” mini-series, a live performance of “Grease” and a slew of other intriguing shows. Electric and engrossing tale about the emergence of the rap group NWA and the Hip Hop culture in Los Angeles in the 1980s. “Straight Outta Compton” was one of the most entertaining films of 2015. Available January 19. Funny, honest, insightful and disturbing. “The Diary of a Teenage Girl” chronicles the life of a 15-year old girl in the 1970s in San Francisco as she begins an affair with her mother’s boyfriend. The film is told from the perspective of the teen (a brilliant Bel Powley). Kristen Wiig and Alexander Skarsgard co-star in this excellent film. Available January 19. Robert De Niro plays a 70-year old widower who becomes a fashion intern for Anne Hathaway. “The Intern” is a charming and effortless comedy, and it’s not hard to see the ‘fish out of water’ possibilities. “The Intern” is a predictable story, but it’s buoyed by the two stars, who are wonderful together. Available January 19. Tense, harrowing film about a storm that sweeps over Mount Everest in 1996, putting a group of adventurers’ lives in peril. The film has a few slow moments, but it delivers some edge-of-your-seat thrills. The large cast (who are uniformly excellent) includes Josh Brolin, Jake Gyllenhaal, Keira Knightley, Sam Worthington, John Hawkes and Jason Clarke. Available January 19. Patricia Clarkson and Ben Kingsley star in this sweet and insightful film about a woman who takes driving lessons from a Sikh instructor. This is a perfect film for anyone who enjoy character-driven stories. The leads are outstanding and the film’s decency really shines through. Available January 19. 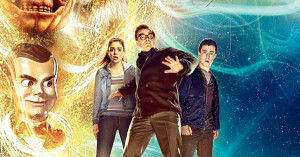 A group of kids accidentally unleash the monsters of Goosebumps author R.L. Stine (played by Jack Black). The film nicely balances humor, creeps and fun, making for a great time for the entire family. Little one may find things a bit scary. Available January 26. Bradley Cooper plays a once-great chef undone by drugs and his own arrogance. Now he is struggling to make a comeback at a London restaurant. The film is a bit muddled, but offers some compelling performances and a scrumptious cast. Available January 26. Director Spike Lee’s latest is an adaptation of the Greek satire “Lysistrata” by Aristophanes, set against the gang violence in modern-day Chicago. The film is energetic, bold and polarizing – the kind that many people will love or hate. Available January 26. This new mini-series stars Lily James, Paul Dano, Gillian Anderson, Jim Broadbent and James Norton in an adaptation of the epic Leo Tolstoy novel. It all looks quite sumptuous. In a unique occurrence, “War and Peace” airs simultaneously on Lifetime, A&E and History Channel. Monday, January 18. The creators of “Arrow” assemble a group of heroes (and villains) from both “Arrow” and “Flash” to battle the immortal dictator Vandal Savage. Looks like lots of fun. Season premiere is Thursday, January 21, on the CW. My love of pirate flicks knows no end. “Black Sails” never takes itself too seriously, making it for one of TV’s best guilty pleasures. Season premiere is Saturday, January 23, on Starz. This four-part documentary series follows Chelsea Handler as she tackles a variety of topics, such as marriage, drugs, racism and Silicon Valley. It’s weird and twisted (hey, it’s got Handler smoking pot with Willie Nelson), and if you’re a fan of the acid-tongued Handler, you don’t want to miss it. Saturday, January 23, Netflix. Scully and Mulder are back and they’re knee deep in plots and conspiracies – just like the good old days. The six-episode mini-series begins with us catching up on where our heroes have been – and where we will be going. We still believe. Sunday, January 24, FOX. New series starring Tom Ellis as the devil. But in a fun twist, Lucifer is bored with his duties and resigns – heading to Los Angeles, where he helps the police hunt down bad guys (plus run a nightclub!). Based on a DC Comics character, “Lucifer” offers lots potential. Monday, January 25, FOX. It’s sort of an adult version of Harry Potter. An attractive cast (naturally) come to Brakebills Academy to learn magic. Monday, January 25, SyFy. Get ready for some summer lovin’! Fox looks to duplicate NBC’s successful run of live musicals with a stab at the classic “Grease.” The cast includes Aaron Tveit as Danny and Julianne Hough as Sandy, as well as Vanessa Hudgens and Carly Rae Jepsen. Sunday, January 31, Fox. Showtime’s critically acclaimed “Homeland” will be set in New York for season 6. Last season was shot entirely in Berlin, Germany. Another Showtime staple, the comedy “Shameless,” has been renewed for a 7th season. NBC is not going to bring back “Heroes Reborn” for another season. Creator Tim Kring had left open the possibility of more stories, but that idea has been nixed. Seth Meyers, host of “Late Night,” has signed on with NBC through 2021. Disney Junior will launch “Elena of Avalor,” a spinoff of “Sofia the First,” later this year. The voice cast includes Aimee Carrero, Jenna Ortega, Chris Parnell, Yvette Nicole Brown and Carlos Alazraqui. Showtime’s resurrection of “Twin Peaks” will premiere sometime in early 2017. The network had initially hoped for a 2016 launch. Goosebumps: Columbia Pictures Industries, Inc.
Why are you advertising CW shows when I can no longer receive the CW channel? Tammy, are you in St. Marys? We hope to have some news about the CW situation there soon! That would be great. I miss many of their programs. My son goes onto their app the day after to keep up with the shows. Tammy, take a peek at the new post on the blog today :-).